Alzheimer’s, Parkinson’s, cancer, stroke, and arthritis have one thing in common: age. By focusing on the connection between aging and disease, scientists at the Buck Institute for Age Research are striving to develop diagnostic tests and treatments that will prevent or delay these conditions. Our goal is to increase people's healthspan - the healthy years of life - so that growing older no longer means growing ill. The Buck Institute - the first independent research facility in the country focused solely on aging and age-related disease - is taking a prominent role in shaping the future of medicine. Its status as a freestanding nonprofit research center allows scientists to initiate new studies quickly and respond to new opportunities in biomedical research, such as stem cell research and regenerative medicine. Our interdisciplinary research approach, dynamic physical design, and support services provide an ideal environment for biomedical inquiry. The Buck Institute is also a place for education, helping to train the next generation of researchers in aging, from postdoctoral fellows to high school students. Institute symposia feature international experts and draw participants from all over the world. The Institute also educates the general public about new discoveries and ways to age healthfully. The Buck Institute for Age Research was created with a single purpose: to make life better for all humankind, through interdisciplinary research on the aging process and its associated diseases. Our objective is to build a future where growing old no longer means growing ill. We hope our research will lead medicine from the current approach of “reactive aging,” responding to symptoms that appear late in the course of chronic illnesses, to a new era of “strategic aging,” in which the use of genetic markers, preventive measures, and new treatments will guarantee that people in their 70’s, 80’s, and 90’s have the opportunity to live healthy, productive lives. There is no doubt about the need for such research. In 2010, the first of the 76 million baby boomers will turn 65, the age when health care costs typically begin to escalate. A third of the more than $1.7 trillion currently spent on U.S. healthcare is spent on services for older Americans, and by 2030, half of our projected $4 trillion healthcare costs will be spent on people 65 or older. The long-term health of our economy is intrinsically linked to the health of our seniors. That is why, in addition to prolonging people's health, we hope our work will improve the United States' fiscal health. The Buck was founded on the premise that ageing and disease are manifestations of the same biological processes, and they can be understood only by working across disciplines. It is a modern take, but it has its supporters, including the US National Institutes of Health (NIH). In 2005, the agency named the Buck as one of five national Nathan Shock Centers of Excellence in the Basic Biology of Aging. And in September, it gave the institute US$25 million to create a new 'interdiscipline' called geroscience: defined as the study of connections between ageing and age-related disease. ....Still, donors seem more excited by the hunt for a fountain of youth than they are about working out the details of normal ageing. “When I say I study ageing, people say, 'You must be rich.' But people aren't rallying to try to understand ageing. They're rallying to cure their son of diabetes,” says Helfand. “The disease people get the money.” The National Institute on Aging's $1-billion budget this year is smaller than that of the major disease-specific branches of the NIH, including those that fund cancer, cardiovascular and brain research. And NIH budgets overall are stagnant — a trend that has hit independent institutes such as the Buck perhaps harder than universities and medical centres, which can count on alumni and patients. But the Buck's vision is to change that picture. If geroscience works, it will produce drugs that may one day cure or prevent afflictions such as cancer and Alzheimer's disease. And that will benefit regular people — maybe even people such as Hughes, who, upon celebrating his 45th birthday, estimates that he is halfway through his own lifespan. “I don't think the point of what I'm doing here is to live to 120, but to live for as long as I'm going to live and be healthy, and to help the field think more clearly about real things affecting real people in real time,” Hughes says. And so it appears that the case for tackling aging itself is really beginning to gain serious momentum. And that is a very good development indeed. My paper "Virtue Ethics and Prenatal Genetic Enhancement" has been accepted for publication in the new online journal Studies in Ethics, Law and Technology. This is timely as the interesting debate I participated in this week over at Crooked Timber was on this very topic! While prenatal enhancement is a very speculative intervention, it is an interesting case to consider because it raises important issues pertaining to parental love and virtue (which underlies my virtue ethics approach). Furthermore, the prospect of parent's having a role in influencing the genetic endowments of their offspring is something that many prominent critics have argued against (see here and here). I think it is a mistake to eschew these potential technologies. And so I thought writing a paper on this topic would be fun and interesting, and it might help raise some countervailing insights to both the critics of such interventions and to those who favour these interventions but adopt an explicit consequentialist approach. In this paper I argue that the virtue ethics tradition can enhance the moral discourse on the ethics of prenatal genetic enhancements in distinctive and valuable ways. Virtue ethics prescribes we adopt a much more provisional stance on the issue of the moral permissibility of prenatal genetic enhancements. A stance that places great care on differentiating between the different stakes involved with developing different phenotypes in our children and the different possible means (environmental vs genetic manipulation) available to parents for pursuing legitimate concerns of parental love and virtue. Key components of the virtue ethics account of morality, such as the Aristotelian account of happiness, love and the doctrine of the mean, provide an adequate basis for rejecting the claim that it is morally impermissible for parents to pursue (safe and effective) prenatal enhancements. Furthermore, there is good reason to believe that a virtue ethics account of morality could actually support the stronger claim that utilising such interventions can (in certain contexts) be morally required. While my argument is not quite"The Case in Favour of Perfection", a more accurate description would be "The Case for Not Prejudging How Parents Can Best Help Their Children Flourish!". One of the main reasons I like a virtue ethics approach to this issue is that the devil is in the details. And so if we imagine what a virtuous parent would do, if faced with the prospect of being able to increase (by utilising an enhancement) the likelihood that their child could live a flourishing life, we realise that much depends on the particulars at play (what other resources the parent has at their avail, what the enhancement in question is, etc.). And so I think bringing these insights to the fore might help us keep a more open mind concerning the ethics of enhancing interventions. 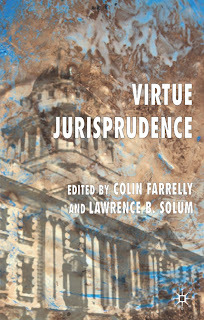 Virtue Jurisprudence, the edited volume Larry Solum and I have been working on, should be out today in the UK. The Palgrave web page also has a sample chapter from the book online for free here. It is the contribution from Robert George and it details "The Central Tradition". In moral theory, virtue ethics offers a third way - an alternative to the deontological and consequentialist approaches that dominated modern moral philosophy until very recently. What would happen if we transplanted virtue ethics into normative legal theory? The essays in this anthology are part of a growing body of work that answers that question. According to the advocates of virtue jurisprudence, the final end of law is to promote human flourishing - to enable humans to lead excellent lives. Can the virtue ethics tradition really help us address the fundamental concerns of legal theory-like judicial review, criminal and tort law? The authors of this volume believe it can. By shedding the constraints of consequentialist and deontological theories, these authors illustrate how the virtue ethics tradition can enrich legal theory in distinctive and diverse ways. Over at Crooked Timber I have been participating in an interesting post on ideal/non-ideal theory. Lots of interesting issues were raised concerning what it is that political philosophers do when constructing normative theories. Towards the end of the comments some detailed points pertaining to Rawls’s theory are raised. And I admit there are different parts of Rawls’s theory that one could emphasize (e.g. the original position, his principles, public reason, reflective equilibrium etc.) and that my criticisms of Rawls might not apply to *all* elements of his theory. Fair enough. But I think that is because there is a deep tension in Rawls’s position. The Rawls who defends public reason and the liberal principle of legitimacy is hard to square with the Rawls who invokes the hypothetical original position to derive his two serially ordered principles of justice. So let me construct what I call the “Are you a Fully Fledged Rawlsian?” Test. If you answer “Yes” to at least 3 of the following 5 questions then I think it is fair to say you are a fully fledged Rawlsian. If you answer “No” to most of these questions, or object to my questions by protesting that other important questions could be asked, then I think it is fair to say you are not a fully fledged Rawlsian (perhaps you are a partially fledged Rawlsian, or just sympathetic to Rawls’s project- which I of course am to some degree). And finally, if you firmly answer “No” to all 5 questions I think you are justified in wondering why so many political philosophers align themselves with Rawls. Test: Are you a full-fledged Rawlsian? (1) Do you believe that liberty should have absolute priority over everything else? In other words, are you in agreement with Rawls’s claim that justice denies that the loss of freedom for some is made right by a greater good shared by others. Or his stance that a basic liberty can be limited or denied solely for the sake of one or more other basic liberties. As a liberal I certainly believe liberty is important, and that we should not interfere or restrict liberty for arbitrary or ill-conceived reasons. But I do not give liberty the privileged position Rawls gives. Much of course depends on what is included in the basic liberties, but I see no reason why we shouldn’t keep an open mind about the possibility that other things (e.g. equality) could justify limiting freedom. For example, in the case of freedom of expression I would support reasonable measures that sought to protect the equality of women or visible minorities at the expense of the liberty of racists and pornographers. UPDATE: Another major concern with privileging liberty like this is that it has enormous budgetary implications. It leads us to take a "spare no expense when it comes to protecting liberty!" mentality. And this is can be unreasonable when there are both (1) other pressing concerns (like health care) that must be balanced and (2) scarcity. (2) Do you believe that justice requires institutions to be arranged so that any two persons with the same native talent and the same ambition should have the same prospects of success in the competition for positions of advantage that distribute primary social goods? Furthermore, do you think this aspiration should be given priority over the aspiration to improve the situation of the least advantaged? My answer is again a “No”. Richard Arneson does a great job of showing the counter intuitive consequences of this principle in “Against Rawlsian Equality of Opportunity” (Philosophical Studies,1999). Let me elaborate on Arneson’s concerns. Suppose two identically talented individuals are born into privileged households- one is born into an affluent upper middle class household and the second into the very richest household. Rawls’s second principle dictates that these individuals should have the same prospects of success in the competition for jobs. But suppose this is not the case. The child born into the richest household has a slight advantage over the equally talented child born into the upper middle class household. According to Rawlsian equal opportunity, we must redress this inequality. Furthermore, because this principle is serially ordered over the difference principle, we are to redress such an inequality independently of any concerns we might have about how such actions might deplete the amount of public funds available to help those with less skills. So, for example, if redressing the inequality between the affluent (yet unequal) talented individuals depletes the funds available for benefiting the truly disadvantaged in society this should not stop us from redressing this inequality. The principle of equal opportunity is serially ordered over the difference principle, so prioritarian concerns cannot trump considerations of equal opportunity. We cannot ask if we should trade some amount of inequality of opportunity among the well-off for a more significant benefit to the least advantaged. Such a proposal would violate the priority rules Rawls imposes on the social primary goods. And I think this is wrong. (3) Do you believe that justice requires socio-economic inequalities to be arranged so that they are to the greatest benefit of the least advantaged? I have italicized “greatest” here because that is the thing that bothers me about the difference principle. I do consider myself a prioritarian, but I am a pluralistic prioritarian. So the magnitude of the benefit is important, as well as the magnitude of the sacrifice we expect others to make. I think Rawls’s priority principle is both too stringent (when taken on its own) and too weak (when it is placed 3rd on his list of serially ordered principles). ..."persons whose family and class origins are more disadvantaged than others, whose natural endowments (as realized) permit them to fare less well, and whose fortune and luck in the course of life turn out to be less happy, all within the normal range and with the relevant measures based on social primary goods". ? Again, I’m afraid I answer "no". Some people in this category are the least advantaged. But by focusing only on the *social primary goods* Rawls misses a big category of individuals whose expected life-time acquisition of the natural primary goods are below half the median. For example, victims of early onset diseases. So Rawls’s neglect of the natural primary goods (like health) really skews things in a way that I think distorts our prioritarian sensibilities. I already had my say on this issue here. So how did you do on the test? Are you a “fully-fledged Rawlsian”? The theme for National Child Day 2007 is The Right to be Active. The theme was chosen to encourage physical activity among children and inform parents, caregivers and educators that physical activity is essential to children’s health and well-being. This theme also reflects Canada’s commitments under Article 24 of the United Nations Convention of the Rights of the Child, which recognizes children’s right to be healthy and enjoy the highest attainable standard of health. Starting children off with a healthy, physically active lifestyle, promotes healthy growth and development, better social development and increased self-confidence to pursue their goals for the future. The theme The Right to be Active promotes physical activity among children and shows parents, caregivers and educators that physical activity is essential to children’s health, development and well-being. This theme is in line with the Government of Canada’s support of initiatives that encourage children physical activity and social development such as the Physical Activity and Healthy Eating Contribution Program, the Children’s Fitness Tax Credit and Canada’s Physical Activity Guides to Healthy Active Living. So be sure to do something active with your kids today! And make physical activity an intricate part of your family's lifestyle. Professor’s face many complex decisions when determining what constitutes the best educative experience they can create for their students. These decisions range from one’s lecturing style to choice of course readings and method of formal assessment. There are of course many different visions of what the ideal educative experience is and how best to achieve it. For example, some professors like to use power point when they teach, while other profs hate and despise power point. Some profs prepare very structured lectures and feel compelled to keep to these plans. And yet others prefer to have a more open and spontaneous approach to lectures and thus they may go off on various tangents if the dialogue with students should happen to go in such a direction, etc. The pluralism of pedagogical strategies and ideals is one of the things I love most about working in higher education. I like to think that I am a reflective educator and I am constantly fine-tuning my craft so as to provide the best educative experience I can for my students. I do not believe there is only one way to be an effective educator. For me, much depends on the level of the students I am teaching (1st year intro vs specialized senior seminar or graduate course), the size of the class (200 students vs 20 students), as well as the material to be covered in the course. Lectures are the backbone of modern university education. Students must listen attentively to a ranting prof while simultaneously jotting down notes, all the while capturing the intellectual structure to the knowledge being proffered. That is not only an honourable challenge for students; it is the task that human beings must master all day, every day, with all people, in all situations. That skill is being lost when students can sit at home in their beanbag chair and listen to a recorded lecture online, pausing all the while to take a note or two, or to warm a slice of last night’s pizza in the microwave. ....Students react to a lecture. Where they look and how, when they sit collectively riveted, laughing or squirming, and the quizzical or unbelieving expressions, all communicate so much. And that communication affects the pace and mood of a lecture. In short, students are major players in the pedagogical experience. Questions are crucial. There are the clarification questions that signal your failure to clearly explain a point. There are also the penetrating questions that take the lecture in a whole different, but meaningful and important direction. In either case the student is performing a service for the whole class and making an impact on the pedagogical process. Every clan has its misfits, but an extended family in northern Scotland is extraordinary. More than half have suffered from schizophrenia or some other form of mental illness. A group of Scottish researchers reported in 1990 that the affected people all carried the same genetic anomaly--a translocation, or swap, of two stretches of DNA on the long arms of chromosomes 1 and 11. With modesty, the investigators wrote that this "may be a promising area to examine" for genes that predispose people to mental illness. The area turned out to be very promising indeed. By the year 2000, it had led researchers to a gene called DISC1, which may be a key player in the chain of events leading to mental illness. The circumstantial evidence for assigning a major role to DISC1 (Disrupted-in-Schizophrenia 1) is strong. Several studies have linked the gene to schizophrenia, major depression, bipolar disorder, and autism; recent findings on DISC1's biological function appear to support the hypothesis. 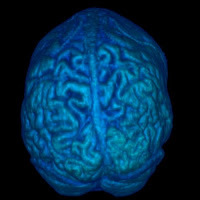 Animal studies have shown that the gene is needed for normal brain development both in the embryo and later in life and that blocking its function produces subtle abnormalities in brain structure resembling those seen in patients with schizophrenia. The protein encoded by the gene also turns out to be part of a nerve cell signaling pathway involved in learning, memory, and mood. "I think this gene is really the first big breakthrough in schizophrenia … and other mental diseases," says Christopher Ross of Johns Hopkins University School of Medicine in Baltimore, Maryland. After decades of following false leads, researchers are cautiously optimistic that they are on the right track with DISC1. But the evidence isn't airtight. Except in the Scottish family, researchers haven't consistently linked any particular DISC1 variant to a mental disease. "There's no smoking gun," cautions psychiatrist Daniel Weinberger of the National Institute of Mental Health in Bethesda, Maryland. But if the connection of DISC1 to mental disorders holds up, it might lead to better therapies for treating the conditions--especially schizophrenia, a devastating disease that is now poorly controlled at best. Of all the arguments levelled against taking drugs for human enhancement, the idea that it is cheating has least power. Yes, when organized competition or formal testing of abilities is the name of the game, drug-based strengthening is questionable and regulations against it need to be adhered to. More debatable are arguments by opponents of drug-based enhancement that it is cheating against oneself. "Personal achievements impersonally achieved are not truly the achievements of persons," said the report Beyond Therapy by the US President's Council on Bioethics, chaired at the time by ethicist Leon Kass. Yet imagine if a researcher could improve his or her ability to memorize the postulated connections in a complex signalling pathway central to tumour development, or if a musician could improve his or her concentration and deliver a better performance on the night. Far from cheating on themselves or others, they would be delivering a higher return on their investment of effort, and indeed on society's investment in them. We all benefit. What is sure is that opponents of enhancement are, to a degree, whistling in the wind. They raise other spectres — unfairness of access (although today's enhancing dose is cheaper than a cup of coffee), possibilities of employer coercion and the loss of human dignity or of the 'natural' — but ultimately, to little avail. Many healthy people still opt for chemical enhancements of all sorts, as suppliers of cosmetics and some pharmaceuticals know well. Such actions betoken an ethical argument on the other side: the pursuit of personal liberty. Let me just expand briefly on these three things. 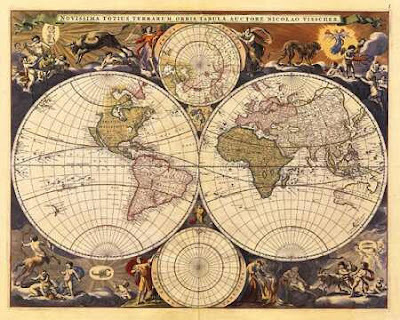 First, the idea of theory as mapmaking. Schmidtz begins by stating that theories are not arguments, they are maps. They are serviceable representations. But they cannot be more than this. They are artifacts. And as such they have a purpose. The thrust of Schmidtz's insights here overlap to some degree with those I have expressed before, concerning what political theory is, and what justice requires "many-things-considered". So if our theories are maps, then we (i.e. moral mapmakers) must have a particular skill-set if our artifact is to help us diagnosis the ills of society and lead us towards a more fair and just social arrangement. So I think Schmidtz's analogy between maps and theories is a useful one that addresses important methodological issues I have been thinking about of late. Trolley: A trolley is rolling down the track on its way to killing five people. Switching the trolley to another track on which there is only one person would save five and kill one. Hospital: Five patients are dying from lack of suitable organ donors. A UPs delivery person walks into the hospital. She is a suitable donor for all five patients. Kidnapping her and harvesting her organs would save five and kill one. Schmidtz notes that when he presents these examples to people most people say you ought to switch tracks and kill one to save five but you cannot kidnap and murder one to save five. Why not? Trolley, argues Schmidtz, "tells us that numbers sometimes matter. Hospital tells us that sometimes what matters is being able to trust others to respect us as separate persons". Unlike the contrived thought experiments philosophers often concoct, the real world does not stipulate that there is no other way. And when people object to Hospital their objection is often premised on the belief that there must be another way. And so when philosophers push these thought experiments these nuanced views about trust and justice are often bracketed or discarded. (3) Schmidtz's critique of Barry. I reviewed Barry's book myself (see here) and I have a lot of sympathy for what Schmditz says. In particular I think Barry is wrong to reject the idea that rights entail personal responsibilities and wrong to endorse the view that inequality is intrinsically unjust. Schmidtz pretty much gets it right when he suggests that Barry's view is committed to the following principle: "a case for radical change can be shown to flow from the premise that unequal holdings of wealth are simply unjust. Plus, not a great deal needs to be said in support of this claim, and anyone who says otherwise is indulging in obfuscation or lies". (438) Later Schmidtz goes on to emphasise that the liberal tradition of equal opportunity puts an emphasis on *improving opportunities*, not equalizing them. And Schmidtz's succinct way of putting this point pretty much expresses why I no longer consider myself an egalitarian. I suppose the one place I disagreed with Schmidtz concerned his concluding remarks about Japanese Americans. Schmidtz notes that "Japanese Americans were able to find their way to a place of closure, and hopefully to a better life for their children and for their children's fellow citizens, even in a world whose history is everywhere unjust" (459). They could not have found this place, he continues, if they had been following a map that represents the terrain of Justice as necessarily a war between haves and have-nots. But if one generalizes this insight to all examples of oppression (e.g. gender inequality) I think we jeopardize what a theory of justice should do. I am not suggesting our theory should invoke a war between haves and have-nots. I think such a view is overly simplistic and unhelpful. But at the same time I think the injustices of the past and present should inform our deliberations concerning how we move forward. For me at least, any map worth defending will give due attention to these features of our societies. Parts of this review article are taken from Schmidtz's latest book: Elements of Justice. And the reading group has agreed to read this in the New Year. So I look forward to hearing more about the details of some of the issues addressed in this Ethics article. The older a person gets the greater the risk of dying from cancer. The chart on the left comes from the Cancer Research UK site and it clearly illustrates how one's age has a profound impact on one's risk of dying from cancer. 75% of cancer deaths occur in people aged 65 and over. Why is this the case? Cancer is largely a disease of the elderly. Most tumors arise in the last quarter of life, with the frequency increasing exponentially with time. Mice (2- to 3-year mean life spans) frequently acquire tumors after 1.5–2 years, whereas dogs (12- to 16-year mean life spans) acquire most tumors after 10 years, and humans (75-year mean life spans) acquire tumors with an increased frequency after 50–55 years of age. This observation has been thought to be caused by the accumulation of DNA mutations in oncogenes or tumor suppressor genes in individual cells over a lifetime (the somatic tissues). This hypothesis is supported by ample evidence from both humans and animal models showing that many tumors contain mutations in crucial tumor suppressor genes and oncogenes. The tumor suppressor p53 gene is the most frequently mutated gene in human tumors, and >50% of tumors harbor mutations in the p53 gene or the p53 pathway. The p53 protein can be activated by a wide variety of stress signals and results in various cellular responses, including apoptosis, cell cycle arrest, or senescence through transcriptional regulation of its target genes. Disruption of normal p53 function is in some circumstances a prerequisite for the development or progression of tumors. By preventing these tumors early in life, p53 is also an important longevity assurance gene. For example, p53-null mice all succumb to tumors within several months, and heterozygous p53 mutant mice develop tumors over a period of a year or more. Li–Fraumeni syndrome patients with heterozygous p53 gene display a 50% cancer incidence by the age of 30. Aging is a natural process with gradual decline of many normal biological functions of cells or organisms. It has been reported that the function of DNA repair, regulation of cell proliferation, and immune response decrease with age in both animals and humans. These findings together raised an interesting hypothesis: could the function of the p53 protein decline with age, which may then contribute to the enhanced mutation frequency and tumorigenesis in the aging process along with the accumulation of DNA mutations? To explore this hypothesis, in this work we investigated the activity of the p53 protein and the efficiency of p53 responses to various stresses in several inbred mouse strains as a function of their ages. ....The results in this work demonstrate that the efficiency of the p53 pathway declines with age, predicting the increased rates of mutation (caused by a decline in DNA repair) and fixation of mutations (caused by a decline in p53-mediated apoptosis) in older individuals, especially in response to stress. This decline of p53 function could, along with the accumulated mutations over a lifetime, explain why older individuals have a lower rate of fidelity of cell division, a higher error rate, and a higher frequency of tumors. Our nation's health and prosperity are based on a foundation of independent scientific discovery. Yet in recent years, political interference in federal government science has become widespread, threatening this legacy. We explore the ways science has been misused, the attempts to measure the pervasiveness of this problem, and the effects on our long-term capacity to meet today's most complex public health challenges. Good government and a functioning democracy require public policy decisions to be informed by independent science. The scientific and public health communities must speak out to defend taxpayer-funded science from political interference. Encouragingly, both the scientific community and Congress are exploring ways to restore scientific integrity to federal policymaking. ....Recent attempts at political interference can be roughly grouped into 4 types: (1) suppressing, distorting, or otherwise misusing scientific information; (2) controlling federal scientists; (3) limiting public access to scientific information; and (4) changing the way scientific information is incorporated into the decisionmaking process. ....Our country's legacy of scientific innovation and investment has brought us sustained economic progress, sciencebased public health policy, and unequaled scientific leadership across the world. The implications of political interference with science in the context of public policy are significant and serious, threatening not only public health, safety, and the environment but also the government's long-term ability to address these critical issues. Suppressing, distorting, or otherwise misusing agency science, restricting scientific exchange, and exerting undue control over agency scientists demoralizes our dedicated cadre of government scientists and threatens agency ability to attract and retain top-notch scientists. Likewise, scientists may be increasingly unwilling to serve on federal advisory committees if they feel subject to political screening or believe their hard work and advice will be ignored or misused. Certain controversial research areas could suffer if scientists perceive they are unlikely to be funded because of ideological preferences. All this, in turn, will diminish government capacity to address current and future public and environmental health challenges. ....Our nation's health and prosperity are based on a foundation of independent scientific discovery. The ability of scientists to conduct research, share their results without government interference or censorship, and participate in the policy process is vital to our democracy. Without access to the best available science, elected officials will be unable to make fully informed decisions, placing our health, safety, and environment at risk. Political philosophers have recently begun to take seriously methodological questions concerning what a theoretical examination of political ideals (e.g.justice) is supposed to accomplish and how effective theorizing in ideal theory is in securing those aims. Andrew Mason (2004) and G. A. Cohen (2003), for example, believe that the fundamental principles of justice are logically independent of issues of feasibility and questions about human nature. Their position contrasts sharply with political theorists like John Dunn (1990) and Joseph Carens (2000) who believe that normative theorizing must be integrated with an appreciation of the empirical realities of one’s society. Rather than bracket questions of feasibility and human nature, empirically oriented political theorists believe that real, non-ideal considerations (like our historical circumstances, problems of institutional design, etc.) must be taken seriously when deriving normative theories of justice. And some justice theorists, most notably John Rawls (1971; 1996), attempt to occupy a middle position that acknowledges some moderate feasibility constraints (e.g. pluralism) but also employs a number of idealizing assumptions (e.g. society is closed, full compliance, etc.) when deriving the principles of justice. The disagreement between those political philosophers who feel inclined to invoke highly abstract hypotheticals when deriving the principles of justice, and those political theorists who take seriously real, non-ideal considerations, is a disagreement over how fact-sensitive a theory of distributive justice ought to be. Mason raises a challenge for the more empirically grounded political theorists when he asks:‘what reason do we have for thinking that any adequate analysis of an ideal such as justice must be conducted in the light of an investigation of what is feasible?’ (Mason, 2004, p. 255). In this article I hope to provide a compelling response to Mason’s question. I believe there is some conceptual incoherence involved in saying ‘This is what justice involves, but there is no way it could be implemented’ (Mason, 2004, p. 255). This incoherence stems from the fact that a theory of social justice, and the principles of justice it endorses, must function as an adequate guide for our collective action. A theory of social justice that yields impotent or misguided practical prescriptions is a deficient theory of justice. If the collective aspiration to implement the conclusions of a theory would not result in any noticeable increase in the justness of one’s society, then it fails as a normative theory. In this article I argue that theorising about justice at the level of ideal theory is inherently flawed and thus has impoverished liberal egalitarianism. I believe that moderate ideal theorists, such as Rawls and Ronald Dworkin, are actually much closer to the idealizing end of the spectrum and thus their theories are not adequately fact-sensitive to be considered realistically utopian. Ideal theorists (falsely) assume that a political philosopher can easily determine (or has privileged access to) what constitutes the ‘best foreseeable conditions’. Furthermore, by assuming full compliance, ideal theorists violate the constraints of a realistic utopia. My new book Justice, Democracy and Reasonable Agreement is now available in the UK (and should be out in North American soon). I have posted a couple of posts about this book before. The book represents about 10 years of work, reflecting my aspiration to reconcile my fundamental moral and political convictions, as well as my disillusionment with ideal theory. So I hope it will have broad appeal to political philosophers. In the book I criticise a range of contemporary theories of distributive justice. One main target is John Rawls. Don't get me wrong, I think Rawls is an extremely important political philosopher. Indeed, the book began as a defence of Rawls. But over the years I have come to realise how limited the kind of abstract thinking that the Rawlsian project has inspired is, and thus I no longer consider myself a proponent of that tradition. Indeed, now I am a critic. And this book explains why I have abandoned the principled paradigm of ideal theory and where I think we (i.e. normative theorists) should turn our attention to- namely, non-ideal theory and a virtue-oriented public ethic. Below I reproduce a small section from Ch. 3 of the book to help give a sense of some of the concerns that motivate the book. The section is entitled "A Parody of the Original Position". Consider the following hypothetical scenario. Given the growing strains on the existing airports in London, British policymakers decide that a new airport should be created. They have grand ambitions for this airport and want it to be better than either Heathrow or Gatwick. These policymakers commission Dave, an aviation expert, to come up with a list of the ‘fundamental principles’ that should guide the planning and construction of this new and improved airport. 1. Assume that concerns of airplane safety, noise and pollution do not arise. So no airplane ever has a malfunction and no citizens will complain about the inconvenience of having an airport in their neighbourhood. 2. Assume that society is a closed society and thus all flights will be domestic flights. 3. Assume that all passengers who will use the airport will be ‘normal functioning’ passengers. That is, no passengers will have physical disabilities that will limit their mobility while getting around the airport or boarding and leaving airplanes. 4. Assume that issues of domestic security do not arise. So there are no terrorists or criminals and thus the airport does not need to worry about the costs associated with extensive check-in procedures. 5. Assume that there will always be good weather so that flights will not be delayed or cancelled due to weather. Having invoked these simplifying assumptions, Dave begins to reflect on what he thinks the ideal airport should achieve. He rejects the utilitarian ethic of company directors who only care about maximizing profits. Dave adopts an impartial, contractual approach to his project. He images what the representative passenger would want from the airport if they were all equal and placed behind a ‘veil of ignorance’. This veil denies them knowledge about things like their preference for the kinds of restaurants and shops available in the airport, whether they will be travelling with or without children, the distance they will be flying and so on. From behind this veil of ignorance passengers only know that they seek to maximize their airport primary goods. These goods include safety, leaving on time and having their baggage arrive safely and promptly at the correct destination. Principle 1: All persons (both passengers and flight crew) have the same indefeasible claim to safety (equal basic safety principle). Principle 2: Equal opportunity for boarding your flight promptly and departing on time (principle of fair equality of opportunity). Principle 3: We should maximize the promptness of getting the last pieces of baggage unloaded from an airplane to the baggage reclaim area (maximin baggage reclaim principle). policymakers will have to struggle with a vast array of issues which Dave’s ideal theorizing ignores. It is easy to support Dave’s three principles if, for example, airport and airplane security are not real concerns or if the congestion created by international flights did not arise. But of course in the real world these things do happen. Air traffic controllers can make mistakes, poor weather affects visibility and causes delays, the volume of international flights increases congestion, security measures delay boarding procedures and may delay flights, and the varying physical abilities of passengers impact the accessibility of an airport. All of these concerns would still arise even in a realistically utopian airport. There are countless complications that arise in the real world that must be taken into consideration when deciding what would constitute the best possible airport we can make. Trade-offs must be made between safety and concerns of efficiency (e.g. costs) and feasibility (e.g. given that humans are fallible and that many things, like the weather, are indeterminate). To bracket or ignore the constraints of the real world is to obstruct, rather than clarify, how we should theorize about what the ideal airport would be. If it is wrong to invoke Dave’s method of ideal theorizing about airports, is it not also inappropriate to invoke similar ideal theorizing about questions of distributive justice? I believe that it is. Like Dave, John Rawls makes a number of simplifying assumptions (e.g. society is a closed system and consists of normal, fully cooperating members)that severely limit the viability of ‘justice as fairness’ as a theory of distributive justice. The publication of A Theory of Justice in 1971 sparked a renewed interest in political philosophy and Rawls’s theory remains the most influential theory of distributive justice in contemporary debates. ‘Justice as fairness’ has been the subject of intense debate, and criticism of Rawls’s theory has come from theorists of almost every stripe. From egalitarians and libertarians to feminists, communitarians, cosmopolitans and multiculturalists, it seems that everyone has an axe to grind with Rawls and grinding that axe often helps his opponents gain support for their alternative theoretical position. The most compelling of these criticisms of Rawls’s theory stem, I believe, from deficiencies which follow from the fact that Rawls functions at the level of ideal theory. This is the cover image of the latest issue of The Journal of Biological Chemistry. It concerns the amazing research being conducted on genetically modified mice at Case Western Reserve University. These transgenic mice over-express a gene responsible for the enzyme phosphoenolypyruvate carboxykinases (PEPCK-C). Researchers have found that the overexpression of PEPCK-C repatterns energy metabolism and leads to greater longevity. So these "Lance Armstrong" mice can eat twice as much as regular mice but weigh half as much. They can also run twice as far, live longer and can reproduce later in life. The BBC has the scoop here (along with video), and the JBC abstract is here. Wow, truly fascinating and exciting stuff! "Gossip as an alternative for direct observation in games of indirect reciprocity"
By Ralf D. Sommerfeld et. al. Communication about social topics is abundant in human societies, and many functions have been attributed to such gossiping. One of these proposed functions is the management of reputations. Reputation by itself has been shown to have a strong influence on cooperation dynamics in games of indirect reciprocity, and this notion helps to explain the observed high level of cooperation in humans. Here we designed a game to test a widespread assumption that gossip functions as a vector for the transmission of social information. This empirical study (with 14 groups of nine students each) focuses on the composition of gossip, information transfer by gossip, and the behavior based on gossip information. We show that gossip has a strong influence on the resulting behavior even when participants have access to the original information (i.e., direct observation) as well as gossip about the same information. Thus, it is evident that gossip has a strong manipulative potential. Furthermore, gossip about cooperative individuals is more positive than gossip about uncooperative individuals, gossip comments transmit social information successfully, and cooperation levels are higher when people encounter positive compared with negative gossip. A 4-year-old Abyssinian named Cinnamon has become the first cat to have its genome decoded. She joins a menagerie that now includes dogs, mice, rats and chimps. Dozens more animals wait in the genome queue — from armadillos to wallabies. The sequence is a rough version that includes just 60% of Cinnamon’s total allotment of DNA 'letters' (As, Cs, Ts and Gs) with many holes in between. But the 'light' treatment, which was done for $10 million, is good enough for some types of studies, the researchers say. The strategy should serve as a model for how to sequence the genomes of other animals that lack a large research community to push for a fuller and costlier genome, says Stephen O’Brien, a geneticist at the National Cancer Institute (NCI) in Frederick, Maryland, who spearheaded the project. “This is kind of a how-to map of what to do when you sequence an aardvark,” he says. The sequence should speed up the discovery of genes linked to cat traits and diseases.